Watch Raees Trailer Online starring Shah Rukh Khan (SRK) and Mahira Khan in lead role. The release date on SRK’s Raees movie also changed. Today, Shah Rukh Khan launched the Trailer of SRK’s upcoming movie Raees through 9 theater across India. He interacted with the audience through UFO technology. Watch Rahul Dholakia and Shah Rukh Khan’s Raees Trailer online here. Raees Trailer Launched, Release Date Changed Again! 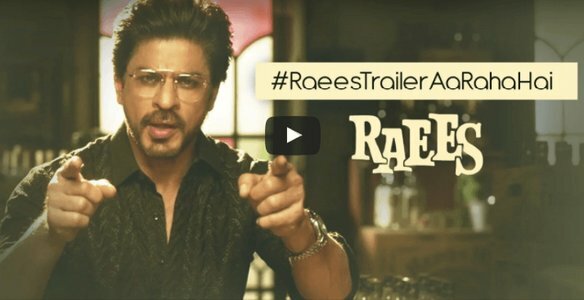 The much-awaited trailer of Raees movie has released online by the superstar himself. A few days back released a video with making a statement “aa raha hu”. He also stated the release date of Raees Trailer at 11:00 AM on December 7, 2016. He also mentioned that he will be interacting with his fans live through the UFO Tech. Raees is one of the highly anticipated SRK upcoming movies as his last two movies “Dilwale” and “Fan” did not perform well at box office. Watch the Raees Trailer Here Below. Shah Rukh interacted with Audience and Media Live through theaters with UFO Technology. These theaters include Delhi – Delite Theatre – Screen1, Moga (Punjab) – Neelam Nova Cinemas (Audi2), Jaipur – Golecha. Also, Cinema – Nile, Kolkata – Menoka Cinema, Indore – Madhu Milan Cinema, Hyderabad-Venkatramana Megaplex (Kachiguda), Ahmedabad – City Gold Ashram Road (Audi1), Bangalore – OSR Screen4 and Mumbai – Gold Cinemas (Milan Mall, Santacruz).